Before social media—and even in its early days—word of mouth advertising (WOMA) relied heavily on family and friend networks, but the rise of Social Media Influencers has changed the WOMA game. Now, popular YouTubers, Instagrammers and bloggers boast thousands of followers, millions of views, and lucrative brand collaborations. And influencers aren’t restricted to fashionistas and foodies. Forbes recently published its list of Top Tech and Business Influencers, highlighting “… social media stars building empires and fortunes online.” PR and marketing professionals recognize the value of that, achieving more than 6X returns for every dollar spent on influencer marketing. But you won’t realize those types of returns if you lack visibility into who your audience is following or fail to build strong, collaborative relationships with the influencers you engage. How do you determine which influencers have the reach you need? Our new eBook, 5 Keys to Measuring Social Media Influencers, takes a deeper look at the value social media influencers bring to brands, and how media monitoring and analytics can help you pinpoint which influencers align with your audience and your brand voice. See how LexisNexis can help. 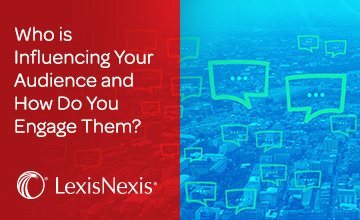 Learn more about LexisNexis Media Intelligence solutions today.